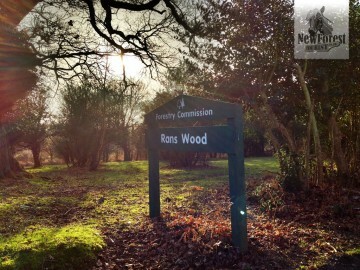 Walk Start / Walk Finish: Rans Wood Car Park at the end of Furzey Lane. Parking: Free parking at a Forestry Commission Car Park. 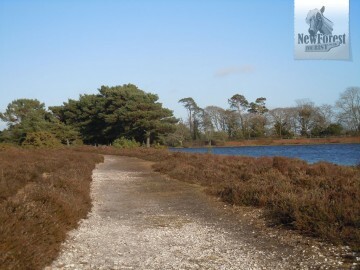 Defining Features: Ancient barrows, earthworks and Hatchet Pond itself make for an interesting walk. Pros: There are some dramatic views of the woods on the northern leg of the walk as they tower up and along into the distance. 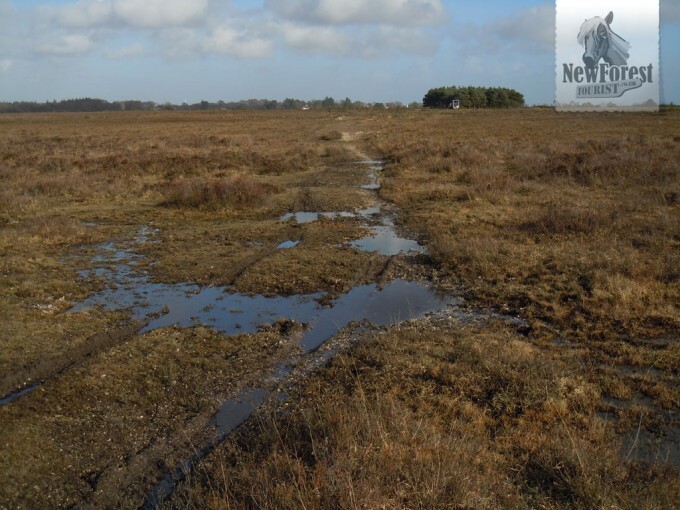 Cons: The first park of the walk can be very boggy and wet, and there are a couple of forest roads to traverse. The end of Furzey Lane marks the start of this walk, and as the New Forest Tourist pulls up into Rans Wood Forestry Commission car park he sees that it’s more of a muddy lay-by in a pleasant woodland glade. 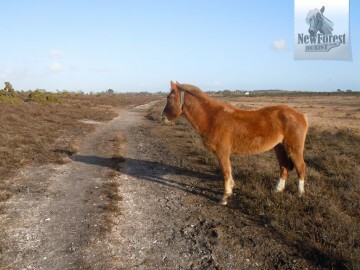 Setting off down the path (past a low wooden barrier and a cycle path signpost) the reassuring familiarity of New Forest heath and landscape is instantly upon him. A charming winding track leads down a gentle slope. To the right, across a grassy expanse is woodland. To the left lies open heath and straight ahead a dilapidated five-bar gate leads up the cycle path to hidden woodland treasures, such as Frame Wood. 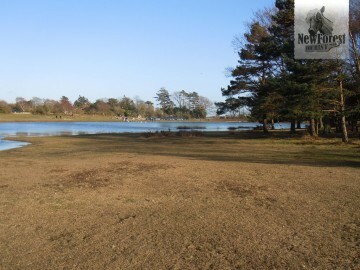 Today, however, the goal is Hatchet Pond, so the traveller turns left this side of the gate and heads onto the heath, hugging the line of trees which climb up and on into the distance on the right. The going is wet and boggy after rain, as it is today. Looking up the gentle incline and across to the left, he ponders the fact that no matter how well he may think he knows the forest, it just takes a new path or route through otherwise familiar countryside to reveal a completely unexpected and entirely new vista. The forest never ceases to amaze, and is never mundane. 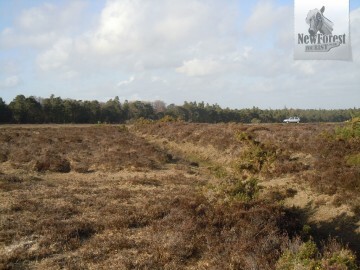 The view to the left and ahead is the classic New Forest heathland. To the right is Little Wood. Through the trees can be seen sandy coloured long grass rising up to more woodland beyond. 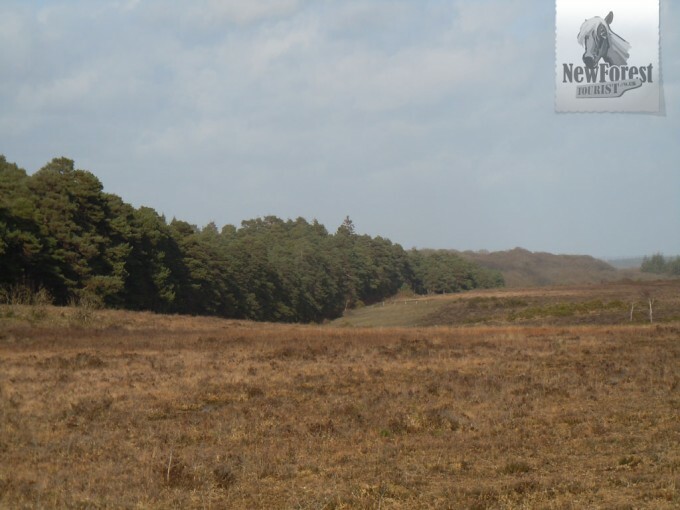 The incline levels out here and there, and just as the walker thinks he is past the worst of the boggy areas, more appear. He begins to wonder if wellington boots might have been more appropriate than walking boots… but before long it improves and dries out. On the horizon the cars become visible, beetling across the horizon towards the end of the line of trees on the right, where they’re swallowed up. On the right the woodland is littered with fallen trees in amongst the tangled grass. Here and there small streams pass underneath drainage causeways into the woods. Unlike more well-trodden routes (such as the walk from Beaulieu to Bucklers Hard) it’s only a very occasional fellow walker that passes by. As the final rise is summited, a clear, green path cuts its way definitively through the low heather; completely dry now. 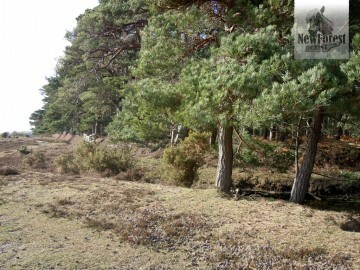 On the left a large clump of pine trees stands on the far side of the road, much closer now. Further along an ancient bronze age barrow rears up, covered in heather. 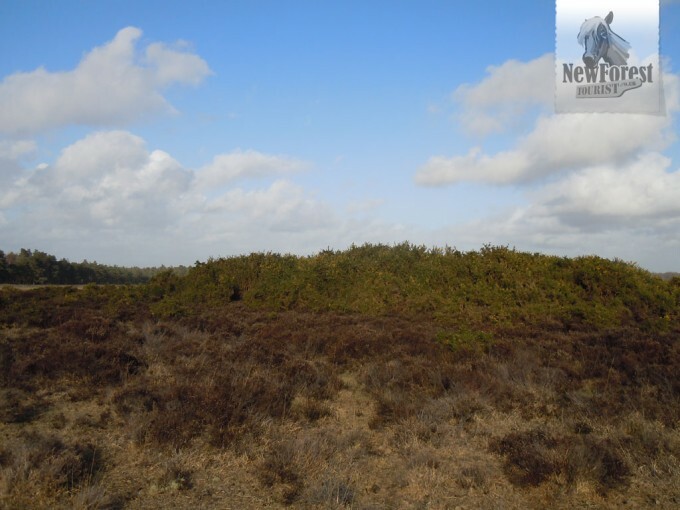 This earthen mound appears on maps marked as a Tumulus (or Tumuli if more than one is in the vicinity) and is one of more than 200 such burial mounds scattered across the New Forest, and is some 3,500 years old. Nearing a corner of the vast woodland to the right, a small pond appears and our wanderer sees the line of trees veering to the right and on into the distance. Ahead the road is quite close now and a careful glance slightly to the left towards the barrow reveals a faint path leading back towards Beaulieu, parallel to the road. Setting off along this path the New Forest Tourist wonders if much more of the walk will be this boggy, as yet more muddy puddles appear, but these are almost immediately passed and the way ahead is dry and clear. Passing the barrow on the right he keeps his eye open for an ancient earthwork bank on the far side of the road, ploughing a line south across the heath. This can be found between the barrow and the clump of trees (closer to the barrow than the trees) and is known as Cerdic’s Bridgehead. Once spied our traveller crosses the road and (keeping the earthwork bank to his left) starts off along the small but clear path to its side. 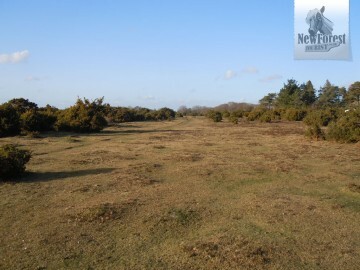 As the Tourist makes his way across the heath, more barrows can be seen in the distance to the right. Even though the path leads away from the road behind, just knowing that there’s another in the distance ahead always gives him the impression of being enclosed; but when disregarding this feeling there is a sense of complete freedom in this vast open space. In every direction is open forest, the only evidence of human habitation and industry off to the left, where (beyond a line of houses at East Boldre) the chimneys of Fawley Oil Refinery can be seen poking their caps above the trees. Ahead is the faint outline of the Isle of Wight. To the right is unbroken forest stretching away to the horizon. For 20 minutes or so the wanderer continues in this direction until the path widens and lowers into a dip in the heath, passing another barrow on the left. Further down are more muddy pools of water, but before them the path forks off to the left as a gravel track. 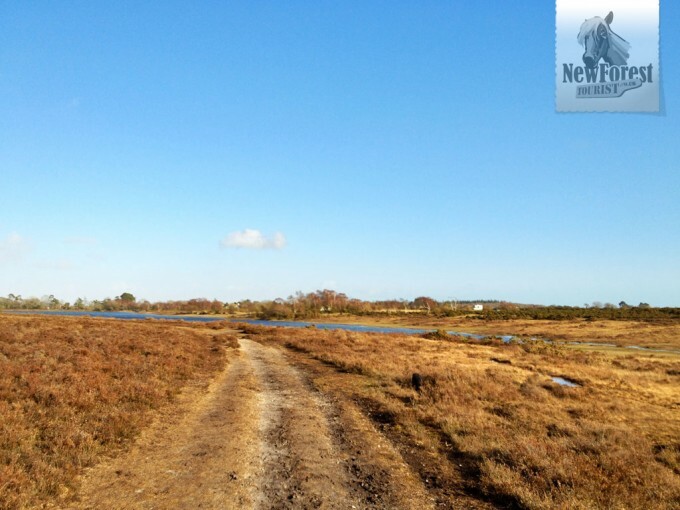 Taking this path up the hill, it’s not long before Hatchet Pond itself finally reveals itself as a thin blue line cutting across the heather ahead. More a small lake than a large pond, Hatchet Pond’s Northern edge passes some way below the path to the right, lapping against the heather banks. Soon the path splits once again, the left fork heading away from the water and the right path closer to the water’s edge. Heading down the latter path towards Hatchet Pond, the tourist’s route bends slightly to the left, following the contour of the bank, and now the water is only a few metres away as he walks on, taking in the attractive grassy banks on the opposite shore. Here picnickers sit on their rugs or play, whilst the occasional fishermen hunker down on their camouflaged stools, merging with the landscape. The road, too, is much closer now; and louder. On the opposite bank the road is approaching a crossroads, so becomes much busier. A small clump of trees lines the path ahead, opposite the Hatchet Pond car park. This is a much larger, busier Forestry Commission car park than the one at the end of Furzey Lane and other tourists are often seen feeding geese, swans and ducks and becoming over-familiar with New Forest Ponies. 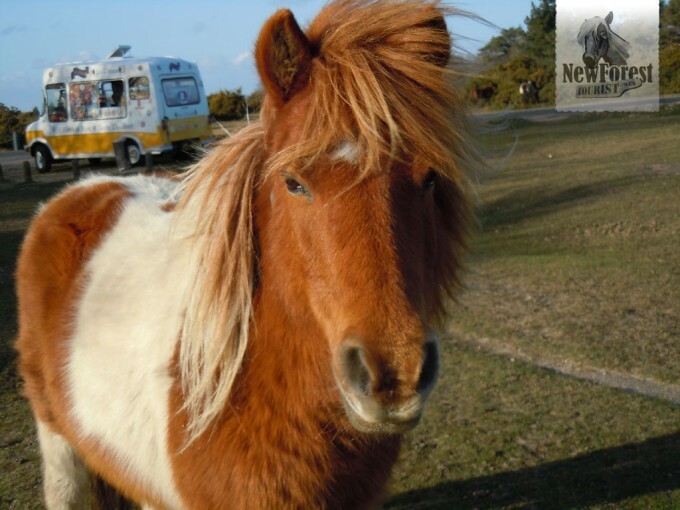 Our traveller remembers posters from his youth warning of the potential dangers of approaching and stroking New Forest Ponies. Although they are not technically wild animals, they can be protective and sometimes defensive, resulting in the occasional injury. This doesn’t, he reflects, stop visitors playing with them and on one or two occasions he has seen parents actually placing their children on the backs of ponies; very unwise. By the time he’s tutted his way past the trees, the path curves to the left. It’s far too boggy to continue along the woodland path, so he skirts the eastern tip of the lake by taking a path around its outside edge; one which leads to the busy car park, ponies, birds, other tourists and inevitable ice cream van. 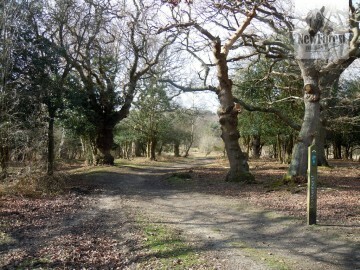 Once out of the car park and across the road, Furzey Lan can be seen to the right. Instead of walking along the road there is a much more pleasant stretch back to the car across the heath. A wide path marks the way and leads the traveller all the way down to the line of houses to the right. Continuing behind the houses and downhill towards the woodland surrounding the Rans Wood car park, the walk is nearly over. One last jump over another muddy but attractive stream leads the rambler uphill into the woods and back to the car.